I wrestled with writing the following, I finally wrote it this morning but knew I couldn't post it. So I went to church where the pastor kept emphasizing that whatever God tells you to speak, SPEAK! Whatever God tells you to do, DO! Moments later after the sermon, someone said LOOK UP! 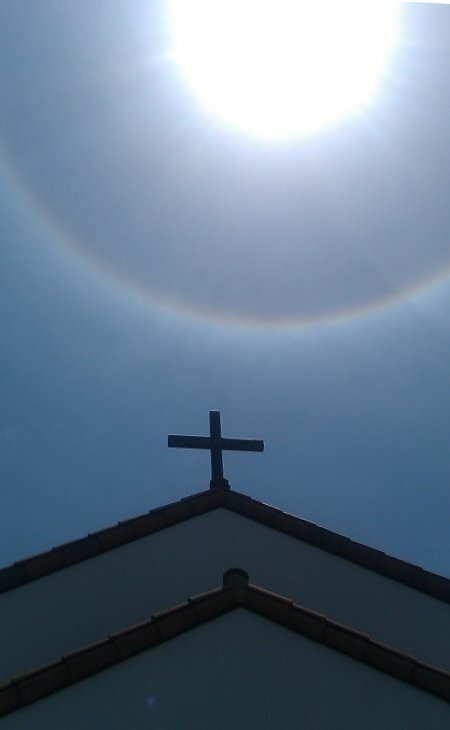 Directly over the church and behind the cross was the only other halo I've ever seen. I had written about the first halo that morning (below). It was a supernatural halo 25 years ago, one that I am now very concerned was "a crown of twelve stars. " A second halo when I was in such prayer for direction about the first halo...it's enough. It's time to post. It’s not my job to convince people. All I’m required to do is admit it. If it’s God’s purpose to do anything with it, He will. It’s all in His hands and timing. Something happened to me 25 years ago and in the years since that remind me of what the Bible describes. I was "clothed in the sun." You have been too if you ever "bathed in the sun." Imagine a woman with barely anything on with the hot sun reflecting tanning oil. It's a modest description by a Biblical man from a time when a modern woman sunbathing would be a shocking sight. But that's not all. 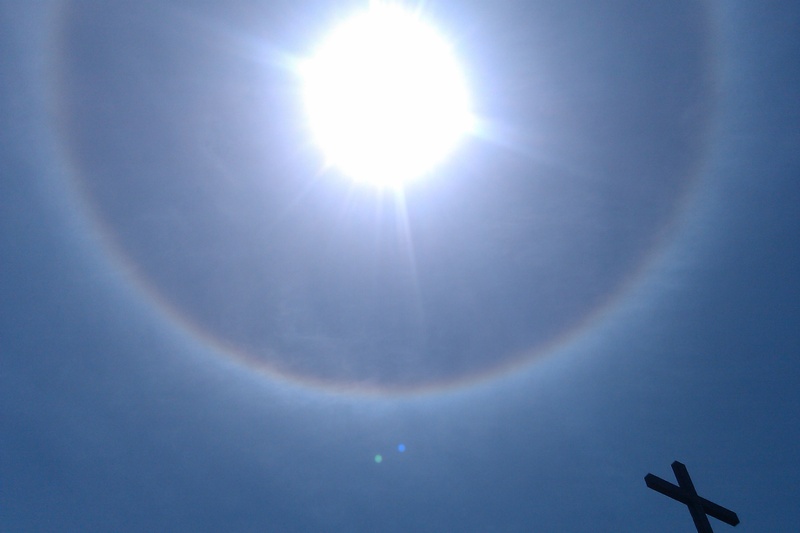 A distinct oval-shaped halo appeared and stretched out over the sky. I mentioned it to the girl laying next to me and we wondered if scientists were "freaking out somewhere," it was so distinct and amazing. I tried to go back to reading a booklet about Jesus but I couldn’t stop staring at it, it seemed to be calling to me. I kept thinking, "What? WHAT?" and then I felt drawn to the reflecting lights dancing on the water just past my feet calling me into the water. I fought it. My mind was on completely worldly things except for reading this booklet about Christ, a booklet I picked up that day without knowing why. But the calling was irresistible and I finally jumped in, feet first, angry at myself for doing such a thing. If someone took a snapshot, there was a moment frozen in time when I was "clothed in the sun", a circle framed in the sky over my head and the moon under my feet...for what is the moon but reflecting lights of the sun? The Hebrew definition even describes it that way. My head was under water for only a split second and when I came out, the sky was blackened with bees. I forgot about everything that was happening up to that point and defensively sank back into the water at eye-level as people were diving and scrambling for cover. Bees were everywhere! I didn’t notice a single one before jumping in, not one. Time passed. I’d like to say I was changed that day, but for a time I continued with my "modern feminist lifestyle," which is more like the woman-at-the-well than anyone pure and holy. But notice the woman in Revelation 12 has no commendation of holiness or pureness. In fact, I think it's a sign that it's a representation of this generation to come as we are because in Christ we are forgiven and saved. The miracle isn't anything that the woman does, it's about what God does and offers to all of us. I was in the thick of our culture at that time...it wasn’t until this divorced single mom was dragged to a Bible study that God exploded into my life and I was restored. Years passed. God became so important that I felt drawn to start a footwashing ministry. We shared the Gospel, gave away Bibles, prayed for people and washed and perfumed feet at various events. Then one day my son missed a day of school and I picked up his in-class assignment. It invited him to weave his life into other religions. I started researching his textbook and was struck by the misrepresentations of Christ and Christians while inviting my son to participate in other religions and worshipping gods. Outraged, I started BlessedCause. Through the website and news media, parents were alerted, CEOs lost their jobs, a corporation lost millions and textbooks were changed. Only God could do all that, only God. Then one day I asked, "What now Lord? What’s next?" and He told me to pay attention to my family even though my sons were now teenagers with little time for me. It was in these days that I read Revelation 12, "clothed in the sun…moon under her feet…crown of twelve stars" and for some reason, the halo in the sky, the reflection of that light at my feet, bathing in the sun…that day almost 25 years ago came to my mind. So I prayed, "Lord, I’m not travailing. I am not pained. This can’t be me because I’m just not." And then it hit me, what is my website, BlessedCause, if not my travailing? (shock) I have hundreds of pages of outrage over blasphemies taught to our children. For years I was unable to stop writing about so MANY affronts even though I was threatened, hacked and my home broken into. Somehow my website has had dozens of search words on the first pages of Google that I can’t explain but for God. I have been travailing and heard worldwide through this website, averaging more than 120 different countries per month in those days. I was heard on Fox News and dozens of radio outlets and newspapers. But if what I know about that day 25 years ago has anything to do with prophesies… okay, I admit it, I am petrified. So I block it all out and lead a quiet life but when I sit down to write, it’s back again. I can’t escape it, this is what I am given to write. That this generation of Gentiles do not understand the magnitude of our sins and yet it is to this generation, so deeply entrenched in Sodom, that Christ offers hope, an escape. The "great wonder in heaven" is not a woman clothed in the sun, the miracle is Christ and what He does! "26 He who overcomes, and he who keeps My deeds until the end, to him I will give authority over the nations; and he shall rule them with a rod of iron, as the vessels of the potter are broken to pieces, as I also have received authority from My Father"
It's like an echo in my mind. All I know how to do these days is pray and wait. Be still and know He is God. I have great comfort in that, because if any of this is true, I'm going to need to live and breath that. I'm not thrilled with the idea of my sons being persecuted, and as I write this, one of my sons has even began to believe what public education has been forcing on him, to question that God even exists! But whatever God wills, I just pray that my family, all of my family, my sons, my nieces and nephews, I just keep praying for them, that they all come to know Christ and are born again. And if you don't know Jesus Christ, you really need to...oh how we need to know Him and be His! Before finishing the above, I left for church. After an hour of listening to an amazing sermon all about doing what God tells us to do and clinging to my reluctance, I just about fell over when I saw another halo so close and hovering over this little church. A woman near me took a couple of pictures of it with her cell phone from the side and emailed them to me. 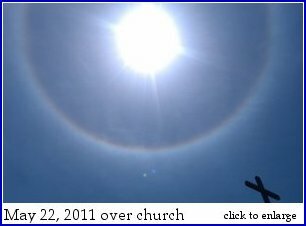 This kind of halo is said to be created by ice crystals and light, (still God's paintbrush) but the halo I saw 25 years ago was in a cloudless sky, it was oblong and white without all the colors so it cannot be explained away. But today's halo was enough. How could I write this but now, how could I not? I believe I am the Revelation 12 woman, not because I deserve it, far from it. But because I know it's not from anything I ever did, it's all about Christ and what He has done for us all. It is His mercy poured out for any of us that receive Him. He is the Good Shepherd that laid down His life and picked it up again. He redeemed us, He cleanses us of all unrighteousness and gives us a robe of righteousness and a ring of authority though none of us deserve it, but because of His great mercy, grace and agape love. All glory and power to the Lord most high! God came down in the flesh and paid a debt we could not pay! The prophesies of Revelation are true. I'm not saying He is coming tomorrow for no one knows the day or hour. But if you have been misled by our public schools into believing this nonsense that all faiths are equal, that there are many ways to God, then you believe Christ suffered the cross for nothing. It's a lie straight out of hell! Christ suffered, died and rose again in three days and three nights. He went through it because there is no other way to be reconciled to Him. It is not intolerance, it is the mercy of God! Christ came for you. Don't miss Him. His arms are open wide! Seek God while you still can. Receive Jesus Christ and live. May God protect our children. I looked up halos in the sky. They do happen. There are some amazing pictures, but nothing like what I saw. The articles say there have to be clouds or fog. There wasn't a cloud in the sky the day I saw it 25 years ago, it was a hot, dry day in San Jose, that's why the pool was so crowded. And it was a long, complete oval around the sun, not a circle, not an arch, a perfect oval that stretched across the sky right over us. That's it. That's all. I don't accept donations. I don't want any attention. I have one purpose to write this and that's to point at Jesus Christ as the Way, the Truth and the Life. Stay close to the Good Shepherd and be wary of false prophets, pray for your pastors and for Israel. Water your soul by reading the Bible. God bless you and keep you, always. In Jesus' name, Amen.